Savvy Spending: TEACHERS: FREE Burger at Red Robin today, 6/5! 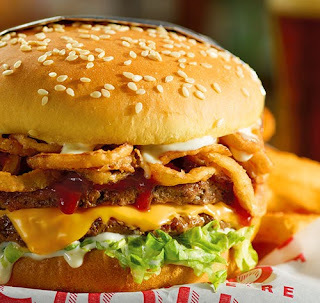 TEACHERS: FREE Burger at Red Robin today, 6/5! REMINDER: This is today! Enjoy! On Tuesday, 6/5/18, teachers, educational professionals and administrators can head on into your local Red Robin Restaurant and score a FREE Tavern Double Burger AND Bottomless Steak Fries ($6.99 value) valid for dine-in or in-restaurant To-Go only. We’d like to thank you for your dedication with a FREE* Tavern Double Burger and Bottomless Steak Fries. Choose from one of FIVE Tavern Double Burgers! No purchase is necessary. Just show us your valid school ID and enjoy your meal on us.No purchase will be necessary – just show your valid school ID to your server! Plus, teachers, admins and other education professionals can sign up for the Red Robin Royalty Program to receive special offers, perks and deals all year long. Just text TEACHER and your email address to 98666 to join (it’s free!). Spread the word and share with your teacher friends! No purchase necessary. Free Tavern Double Burger does not count as an item for Red Robin Royalty. Limited to $6.99 Tavern options. Excludes Big Tavern. Includes add-ons and modifiers. Offer not loaded on Red Robin Royalty account. At participating Red Robin restaurants on Tuesday, 6/5/18 only. Dine-in or in-restaurant To-Go only. Excludes online orders. Valid for all teachers, educational professionals and administrators. Teacher/School ID required upon visit.